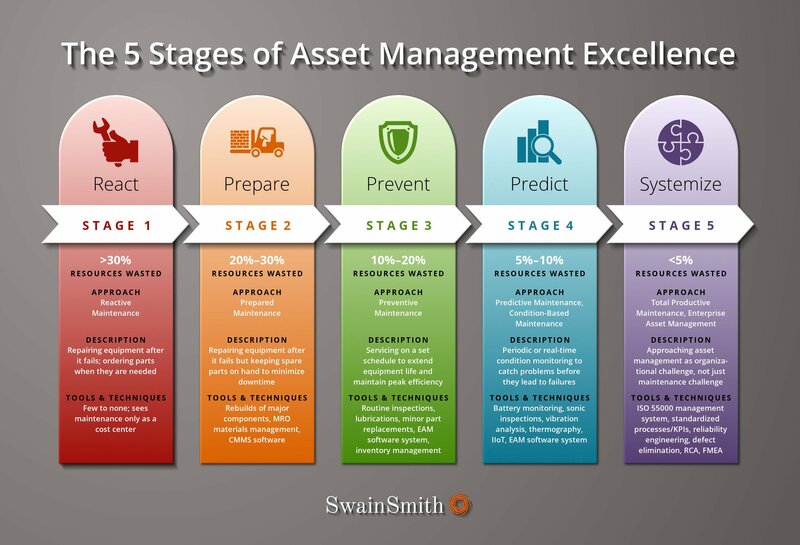 The 5 Stages of Asset Management Excellence | SwainSmith, Inc.
Asset management excellence is a journey. In the early stages, organizations approach maintenance as a cost center. They are reluctant to invest in asset management because they see it as a waste of resources. Organizations that are farther along understand that asset management can be one of a business’s biggest profit centers. They dedicate more resources to keeping their equipment, infrastructure, fleet vehicles, and other physical assets in good condition. As a result, they see significant value creation. The infographic below describes the five stages on the journey toward asset management excellence. (Click on the image for a high-resolution version.) It’s our take on what is commonly called a maintenance maturity model. We’ve also summed up each stage in a short paragraph underneath the graphic. At this stage, organizations invest the bare minimum into maintenance. Assets are repaired or replaced when they break down, often causing production delays or other downtime. Because assets are not maintained in a healthy condition, safety and environmental risks are high. Organizations in Stage 2 recognize that managing maintenance better can reduce costs and improve asset availability. They don’t have a formal maintenance strategy, but they usually have a system for managing work orders, keep spare parts on hand to speed up repairs, and rebuild major components instead of replacing them to save money. By Stage 3, organizations have gotten serious about their maintenance programs and are seeing the impact on the company’s bottom line. They service assets on fixed schedules to maximize uptime and minimize emergency repairs. Organizations at this stage often invest in enterprise asset management (EAM) software to help them manage preventive maintenance (PM) routines and MRO inventory. Organizations in Stage 4 have invested considerable time and money into asset management. They perform regular predictive maintenance (PdM) inspections and use advanced technology, including the industrial internet of things (IIoT) and EAM software, to monitor asset condition. Condition-based maintenance (CBM) is another term that is used to describe organizations at this stage. By Stage 5, organizations have realized that asset management is not merely a maintenance challenge, but an organizational challenge. In addition to EAM technology, they have a corporate policy and documented business processes for asset management. They also have a structured program for continually improving asset reliability, maintenance productivity, and MRO supply chain performance. They are thinking holistically, utilizing a management system (i.e., model-based) approach to improvement.<? The journey toward asset management excellence doesn’t happen overnight. It involves an organizational paradigm shift—away from an unplanned, reactive approach and toward a strategic, structured one. The journey can involve a significant investment in maintenance programs and technology. But for most organizations, the benefits far outweigh the costs.<? Do you know how your asset management measures up? Do you have a prioritized plan for improvement? If not, SwainSmith can help. Find out what stage your operation is at, and get tailored recommendations to help you progress to the next stage, with our Value MapTM assessment.